Here’s a late-in-the-day Peterson Valentine you can print, cut & deliver to your Significant Other, one of two my co-author Gary Malmberg found in doing research on the first decades of Kapp & Peterson. We’re saving the other one for publication in the book, but both are from 1912, printed by the same publisher in the United States, and both featuring the P-Lip of Kapp & Peterson’s Patent System Pipe. The P-Lip was the third and final patent Charles Peterson secured, as you probably already know. 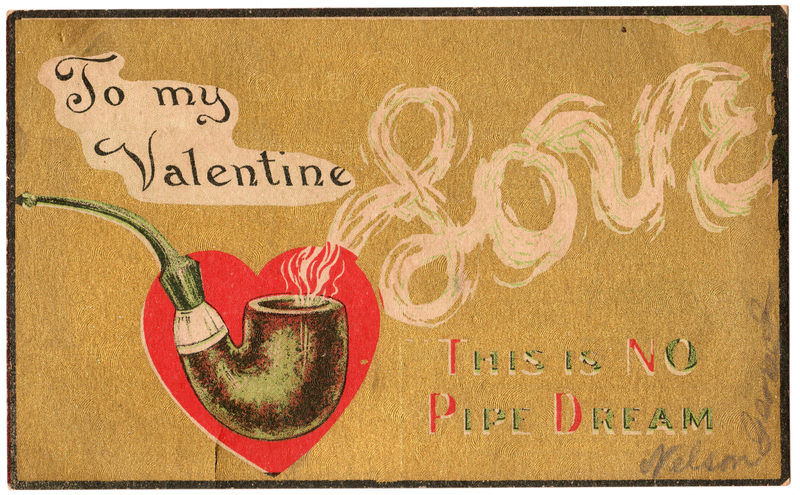 It’s amazing to me that a mere 12 years later its influence would be so widely felt in the pipe-smoking world. I haven’t posted to the blog in awhile, as we’ve been working like mad to the first draft of our manuscript for The Peterson Pipe: The Story of Kapp & Peterson completed. We had hoped to have it done by Christmas, but it was actually February 4th when the last paragraph was written. We have two jobs this spring: first, to edit the final manuscript for submission to the publisher and second, to begin packaging up illustrations and writing captions for each chapter. At this point our publisher at Briar Books Press doesn’t think a release date before early 2016 is possible, given the amount of work ahead in editing and layout and design, not to mention indexing and printing. This was a real disappointment to me, but as he walked me through the process, I began to see his point. We had really hoped for a fall 2015 release to coincide with Peterson’s 150th Anniversary celebration, but it doesn’t look that that will happen. We’re turning thoughts now to a book launch at the Chicagoland Show in May of 2016. Both Gary and I work regular day jobs, of course, but looking back through my journal, I can’t find three days in the last year when I didn’t spend time on the book. The manuscript is a dense 120,000 words at this point, and to my mind pretty solid. There’s twelve chapters covering every conceivable aspect of history, smoking, and enjoyment of the Peterson pipe, including an encyclopedia of shapes and lines, an annotated bibliography of the Peterson ephemera, a huge chapter of interviews with present and past Peterson artisans, and of course a thorough history of the company itself and its pipes through the decades. Almost all the photography and digitization has been done, but we’re still taking a few photos and even waiting on a few items. Just this past week we got some amazing photographs and press clippings about a certain famous South African statesman’s K&P pipe which seems to have been the inspiration for a pipe Peterson is releasing in just a few more weeks . . . .
There’s so much about the pipes that simply won’t fit in the book that I’m hoping to get a couple of blogs in every month from now until publication. Coming next—a three-part look at everyone’s favorite Peterson Chubbies. Bummed the book won’t be ready for Christmas! But good things come to those who wait. I can’t wait for your blog on Peterson’s chubbies. We are talking old Shamrock 999s? No more bummed than me, I assure you. And how are you hacking into my blog files???!! Yes, the “John Bull” / Old 999 is up first.